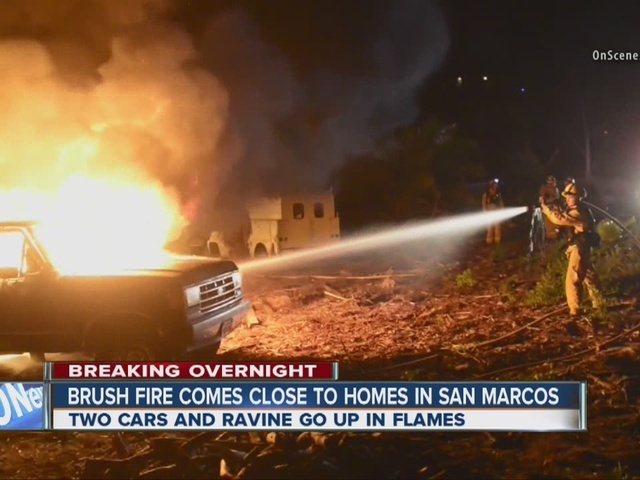 SAN MARCOS, Calif. – A brush fire that engulfed two vehicles came close to homes in San Marcos overnight Sunday, prompting a multiagency response. The fire was reported at around midnight in the 2100 block of Esplendido Avenue, near Companero Avenue. According to Cal Fire, responding crews discovered two cars ablaze and a fire that was rapidly spreading through surrounding vegetation and threatening four nearby homes. It took about 45 minutes for Cal Fire, Vista and San Marcos firefighters to bring the intense flames under control. The effort was made more difficult by the rough terrain and thick brush. A San Diego County Sheriff’s Department helicopter was overhead, but was unable to make water drops. No homes were damaged and there were no serious injuries, although one firefighter reportedly sustained a broken finger. No residents were evacuated. The cause of the fire and exactly where it sparked were under investigation by Cal Fire.